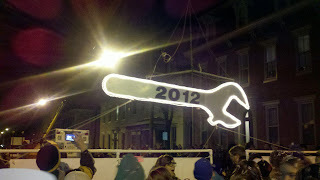 Many towns in our area lower an item during the count down to the New Year. Hummelstown lowers a lollipop. York drops a white rose. Harrisburg lowers a strawberry and Dillsburg has a "pickle drop". In Mechanicsburg we have a Wrench Drop since our town was named for a settlement of mechanics who repaired Conestoga wagons in the early 1800's. The celebration, held on downtown Main Street was originated by local Mechanicsburg Area School District graduate Sheldon Rodgers for his Eagle Scout project. 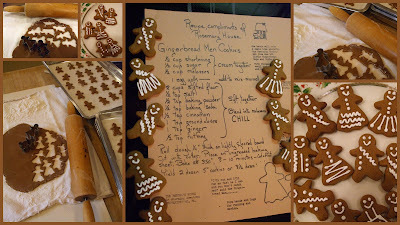 We welcomed family to our home over the holidays, and were quite excited to see a Facebook posting by one of the new local bakeries in town, Oooolala With a Kiss for a drop-in cookie craft scheduled for Christmas Eve day. Mrs. Klaus welcomed us to the bakery where the kids could select a large snowflake sugar cookie, liberally frost it with red, white, or green icing, and then decorate it to their hearts content with a wide variety of sprinkles, sugar decorations, M & M's, and more. It was quite fun, and the perfect way to keep the youngest ones entertained as the excitement for Santa's arrival was continuing to build throughout the day. Several of these cookies were enjoyed after dinner, and a few were specially placed for Santa, along with a carrot or two for the reindeer. Such fun! The celebrations have since concluded, the cookies are long gone, the family has all safely returned home, but the memories of special times and festive moments continue to dance in our heads. May you find Happiness and Joy within your heart this holiday season. 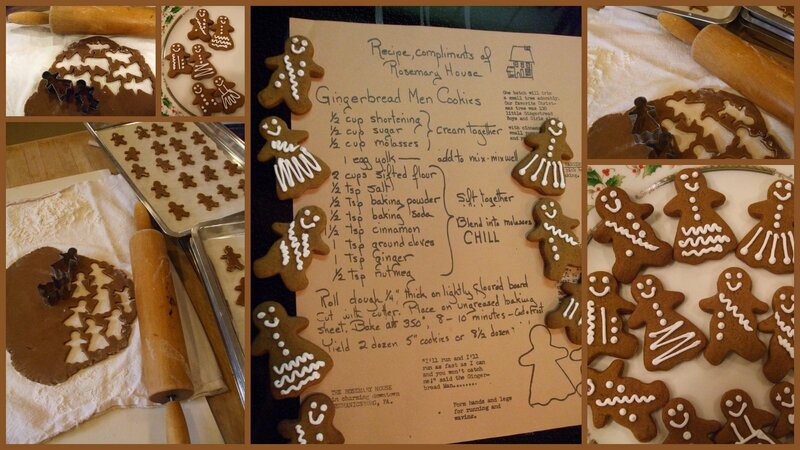 It's soon cookie making time at our house. One of the younger kids has been asking when we will make cookies. It's on the agenda for Thursday, and she won't let me forget! In the meantime, you might consider this easy little treat (found on Pinterest!) for a substitute for cookies on your tea tray this year. Bake a batch of brownies, cut rounds from the baked brownies, and top with a thin pointy strawberry. Pipe icing around the base of the strawberry, and a dollop on the top, and you have some cute little hats for Santa and his elves. Any soft icing will do, but I'm happy to share the recipe I used. Cream Crisco and margarine until blended. Add remaining ingredients and beat well, approx. 5 minutes until light and fluffy. Keep icing refrigerated. What do you suppose Santa prefers in his teapot? Something strong and hearty, such as a Keemun? Something traditional, English Breakfast? Something caffeine free and herbal, peppermint leaves maybe? Something with a holiday note to it full of orange and spices, Holiday Tea? Or perhaps, simply, hot chocolate. What's in your tea pot today? Lemon Verbena Lady Shares her Adventures! Family Friend Nancy Heraud of Lemon Verbena Lady's Herb Garden visited Sweet Remembrances for Afternoon Tea and then stopped in The Rosemary House for some holiday shopping. 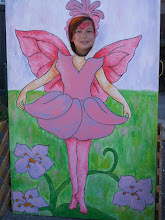 She has shared her thoughts and a variety of photos as a guest blogger for Mother Earth Living. You can read her article by following this link. In addition, if you visit her blog, she shared a wide variety of photos from the tea room and gift shop. This link features pictures in the tea room, while this link is a wonderful tour of The Rosemary House. And finally, following this link will take you to Nancy's blog post that features the Afternoon Tea she enjoyed at Sweet Remembrances, and some additional decorating photos from the tea room. Thank you, Nancy, for sharing your adventure with your blog readers and with Mother Earth Living. Holiday books serve as instant decoration in the tea room at this time of year. On the shelves you might find the classic and sentimental A Cup of Christmas Tea by Tom Hegg. Actually, if you look closely, you'll find several copies in different form, including a small ornament on the tea tree. Nestled beside this book is the Festive Cakes of Christmas. Published in 1981, it is a treasury of old traditions, recipes, and lore of the Christmas season. Beginning with Advent, and including St. Lucia's Day (Dec. 13, Sweden), Christmas, Boxing Day (Dec. 26, England) and more, it ends with Candlemas (Feb. 2). Such recipes as Amish Date-Nut Cake, Moravian Sugar Cake, Sachertore, Julekage, Dundee Cake, Buche de Noel and more are included in this informative book. It's a world full of lovely traditions, and many are shared in this book. A Cozy Christmas Tea by Sandy Lynam Clough is on display in the hallway, alongside the second copy of A Cup of Christmas Tea. This book was published in 1998 and is full of the beautiful artwork for which Sandy Lynam Clough is known. Lovely quotes and some teatime recipes are sprinkled throughout this book and the reader is encouraged to share a warm cup of Christmas cheer with dear friends. And tucked on display with the Santa collection is a pop-up copy of The Night Before Christmas. We recently prepared a stock pot full of Bountiful Black Bean Soup for dinner. Using Bob's Red Mill soup mix, and following the easy recipe on the back of the package, we had a delicious meatless meal. You can find the recipe on their website by following this link. Quick, easy, hearty, and tasty, we plan on making this one again. The recipe serves 10, so plan on preparing it for a crowd! Our special holiday tea featuring Queen Victoria was held today. The tea began with a Cranberry Relish accompanied with assorted crackers and buttery cream cheese florettes. The sandwich selection featured Marinated Roast Beef with Dijon Mustard on Parmesan Biscuits, Jarlsburg Cheese Melt with Sauteed Onions and Apples on Toasted Triangles, Sun Dried Tomato Cream Puffs filled with a Herbed Cream Cheese, Curried Chicken Salad in Mini Fillo Cups, and warm Basil Pesto Pinwheels. The scone course included Kensington Palace Scones and White Chocolate Apricot Scones served with Sweet Cream and Rose Geranium Jelly and a fresh fruit garnish. And dessert, a miniature Victoria Sponge Cake with Strawberry Jelly and Cream, a Petite Egg Nog Filled Puff, and Sweet Raspberry Coconut Triangles. We were pleased to welcome historical first person interpreter Alisa Dupuy as she portrayed a young Queen Victoria in her glorious gown with crown and jewels. She shared about her life, her upbringing, her love for Prince Albert and their nine children. Yet another variation on the Cucumber Sandwich... this one, a Christmas Tree. The idea for this sandwich came from Tea Time Magazine, but this is my adaptation. I spread a French Style Cream Cheese as base on the bread. Then, using a mandolin, cut thin slices of cucumber (3 for each tree), and then cut them in half. Place the cucumber slices on a paper towel to absorb some of the moisture of the cucumber. Place the slices, in an alternating pattern on the bread. Top with a petite star, cut from cheddar cheese. Liberally sprinkle with dill weed. Happy Holidays! George Weigle, our favorite garden writer, was here last week to tape a DIY wreath crafting video with Susanna. Want to learn a simple trick for beautiful wreaths? Click on this link to check it out! Yesterday was SereniTea Wednesday, and the tea tray was laden with holiday treats. 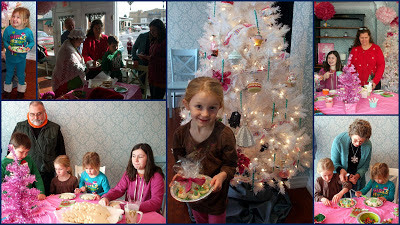 Decorated with a festive holiday bow and glittery ornament, it set the scene for a holiday tea. Among our guests that day, we welcomed a couple celebrating their 45th wedding anniversary, there were friends just getting together during the holiday season, and there was a mother-daughter duo celebrating the mother's 83rd birthday. And, another mother-daughter duo that surprised me with a Christmas present - tea themed, of course! The tabletop tea tree is up (has been for awhile!).... 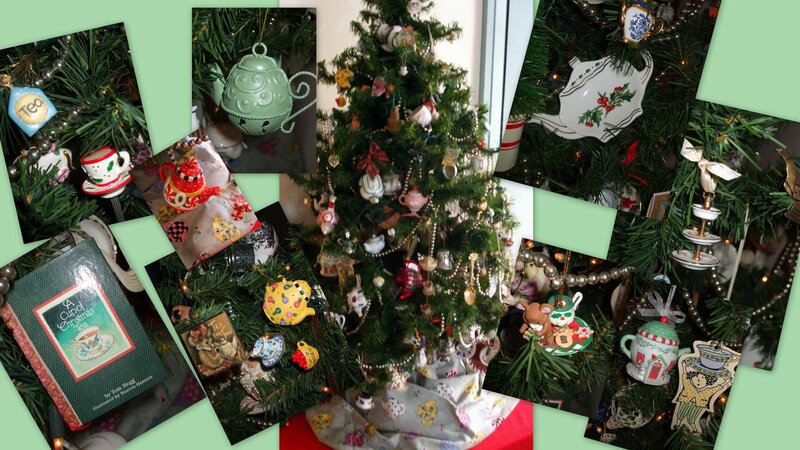 it's always such fun to see all the little tea time treasures ~ the tree is decked with tea pot ornaments, tea strainers, tea caddies, small pieces of jewelry, and anything else the has a tea theme. There are so many little trinkets tucked all over this tree, it's quite fun to see what you might discover among the branches! Wish you could smell these spicy little cookies! A thin scrap of board cut in the triangular shape of a tree forms the basis for this holiday decoration. The board is then tightly covered with chicken wire which is your mechanic to hold all the holiday greens in place. Next choose a variety of short stem greens and holly and then tuck and poke the stems of all the fresh greens under the chicken wire. Simple, easy and quick. Save the board to use year after year. If you soak the greens in a bucket of water to condition them, they will stay fresh looking outside through New Year's or inside the house for 2 weeks.